We offer the best quality transparent business cards in Delhi, NCR and India at Very cheap price. Make your brand pop while leaving a lasting impression with 20PT Clear business cards. These cards are also called transparent business cards. They are incredibly durable and our 20PT plastic is slightly thinner than your standard credit card. They’re great for VIP cards, ID cards, Reward cards, gift cards and more. Each card shipped with a protective film that needs to be removed once received. Choose from a large selection of sizes and shapes (standard, oval) and printing options. All plastic cards will have rounded corners and printed in the USA. Stand out and be unique and get noticed with plastic business cards. Are you on the hunt for a handy and powerful marketing tool for your business? Or wanting an effective solution to improve your business? There is nothing better to elevate your business to a higher level than an innovative business card. Forget that business cards can be created with only standard paper. 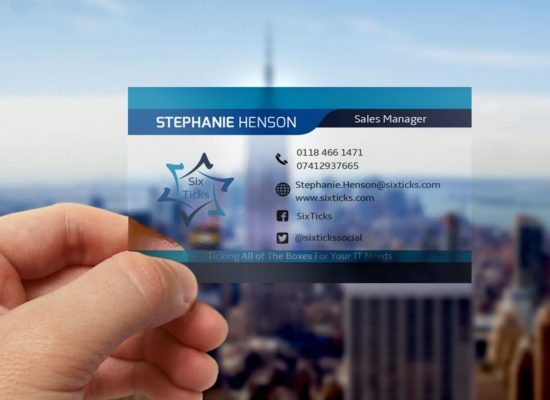 In today’s age of cut throat competition you need to shine through the crowd and what better way than to have a jaw-dropping transparent business card! Transparent business cards can be a designer’s dream with countless options open for the extra effect. There are many who want their business cards to be more than normal rectangular pieces of paper; however, they can get overwhelmed while deciding the best quality transparent cards printing service provider. Designing and printing a business card is very industry based with a lot of personal preferences involved. It is best to take advantage of ‘Ruby Print’ professionals who have the creativity to implement your vision. We have varied and innumerable design combinations with options of 4 color/Pantone color technology. Special effects provided by our team of experts using tint screens, faux frosted look and several other design options give an elegant, chic and a very professional look to your business card . Our clear Plastic business card printing services India offer customized solutions to satisfy the requirements of every customer. Transparent and plastic business cards are a handy means of making a strong marketing statement. They generate a buzz about your business and make a lasting impact on the client’s mind.